The tight end position has always been thin. There are rarely 12 solid options who can be trusted through and entire season, and with the sea change at the position (coupled with Hunter Henry’s season-ending injury), it’s shaping up to be another year without much tight end depth. With that said, the top-end production, led by Rob Gronkowski, is arguably the best it’s ever been. And for the past several years, Greg Olsen has been in the tier just behind Gronkowski. 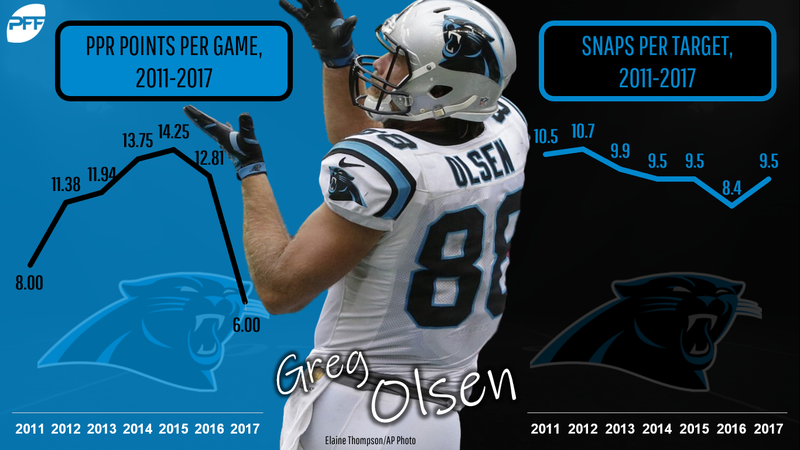 But due to a combination of poor play and injury, Olsen was a major bust in 2017. He caught just 17-of-34 targets for 191 yards and 1 touchdown. He played in seven games, which means he gained under 30 yards per game. I won’t harp on Olsen’s 2017 campaign too much, because it’s obvious that his foot injury played a significant role, even when he was on the field. But he was certainly a disappointment even once he “returned” from injury, especially because he played over 92 percent of the snaps throughout the fantasy playoffs. It was enough to make people think he might be truly back, but that wasn’t the case. Our early 2018 projections have Olsen projected to finish as the No. 6 overall tight end with 63 receptions, 807 yards, and five touchdowns. This would be down from his 2014-2016 production — when he posted three-straight 1,000-plus yard seasons — but it would be enough to make Olsen a top fantasy tight end again. The PFF Fantasy rankers have Olsen as the consensus No. 5 tight end. The Panthers selected a wideout in the first round of the 2018 draft (D.J. Moore), and Christian McCaffrey — the team’s target leader from 2017 — now has a year with Cam Newton under his belt, but Olsen has a long, established rapport with Newton. Olsen was the team leader in targets in both 2015 (114) and 2016 (122), and he was second every year 2011-2014. From 2011 to 2016, Olsen averaged 107 targets per year. Despite the poor overall production last year, Olsen was still a top target. In other words, Olsen’s usage was not down last year; it was in line with the rest of his career in Carolina. Assuming he’s healthy — and he did just sign a two-year contract extension, so the Panthers clearly have faith — Olsen should see 110-plus targets again in 2018. It might be weird to call Graham a “bounceback” candidate, because he led the position in touchdowns last year (10) and finished as the No. 4 tight end in standard leagues and the No. 7 option in PPR leagues. However, he is certainly a candidate to “bounce back” to the top; it wasn’t too long ago that Graham was right there with Gronkowski atop the tight end rankings. Graham’s 20 end-zone targets were most among all tight ends last year — by a wide margin. Next-closest was Gronkowski (13 end-zone targets). Only DeAndre Hopkins (26) had more than Graham. Graham converted 9 of his 20 end-zone targets into scores, good for a 45 percent success rate. This was on par with Gronkowski (46.2 percent) and Travis Kelce (50 percent). As this recent PFF article about the Aaron Rodgers-to-Jordy Nelson connection illustrates, Nelson was one of the most-utilized and most-effective red-zone threats with Rodgers. If Graham can produce double-digit touchdowns again — which really isn’t hard to imagine given the void he’ll fill — and his yardage can creep up to the 900-plus yard range again (which is where he was in 2016), he’ll return to the truly elite ranks of the fantasy tight end group. It won’t be a cakewalk, obviously. Our projections actually have Graham slotted for 59 receptions, 625 yards, and 6 touchdowns, good for the No. 11 overall finish. But when considering Graham’s usage and ability in the red zone, Rodgers’ pure talent, and the void left by Nelson, the puzzle pieces seem to fit. Reed has flashed truly elite fantasy potential throughout this career, but he has never been able to stay healthy for long enough to piece it all together. Last season, Reed posted a line of just 27-211-2, but he really only had five healthy games. Reed flashed his true potential in 2015, when he posted a line of 96-1,072-12, good enough to finish as the No. 2 overall tight end. Is Reed a risk? Obviously. But he seems on track to be healthy for Week 1, and with a tight end-friendly quarterback now in town and Washington (still) lacking a true No. 1 receiver to vacuum up all the targets, the door is open for Reed to morph into a top-five option once again.